Fresh herbs add fragrance and flavour to food that can’t be matched by dried herbs or other flavourings. Growing your own herbs allows you to experience the sheer pleasure of picking your own mix of herbs; whether it is a few sprigs of parsley, some sweet smelling basil leaves or origanum, with its earthy tang. The beauty of herbs is that they grow any sunny corner, whether it is in a separate herb garden, as companions for veggies or mixed up with the flowers. No matter what size of garden you have, it is possible to have a range of culinary herbs at your fingertips. Although we all have our own preferences, the most popular culinary herbs are parsley or Italian parsley, mint, thyme, sweet basil, rosemary, chives, and marjoram or origanum. 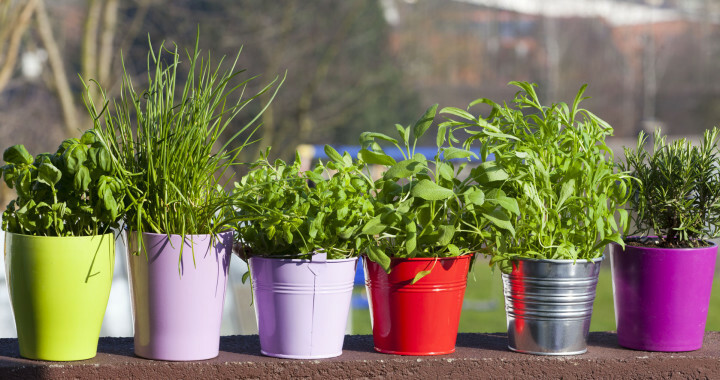 If you are thinking of starting a herb garden, these are the one’s to choose. Except for basil, which is a summer annual, and parsley which can be grown as an annual, the others are hardy perennials that just keep on going. To this collection, you can add sage, which is a bit more difficult to grow because it doesn’t like being over-watered, and those with a very distinctive taste like coriander, Vietnamese coriander “Hot Mint’, chervil, tarragon, and fennel. Most culinary herbs originate from the Mediterranean, where they grow in poor soil, in hot dry summers. When growing them in your own garden, choose a position that gets at least six hours of sun a day, and prepare the soil with compost to ensure good drainage. Water newly planted herbs regularly until they are established and then water less often; once a week in summer and once a month in winter. The more you pick herbs the better they grow and produce new leaves. Regular picking prevents the herbaceous varieties, like thyme and rosemary, from becoming woody. Remove basil flowers as they appear otherwise the plant quickly goes to seed. Feeding monthly or every two weeks with an organic liquid feed at half strength, is necessary to produce new leaves, especially if the herb is picked regularly. Herbs are seldom affected by pests or diseases but should you notice an infestation of red spider, cut the herb down to the ground and remove the infested growth. It will sprout new healthy growth. Herb leaves can be harvested at any time, although the least favourable time is at midday. Only pick what you need and use as soon as possible. Thyme, rosemary, origanum and marjoram, dry well. Let the leaves dry naturally on brown paper or newspaper in a cool room. Place all the ingredients in a blender or food processor and blend until it reaches the desired texture. Taste and season. Store in required quantities and freeze. To use, stir it into freshly cooked pasta, or add it to soup, sauces, pizza, casseroles, vegetable dishes and roasts.